Cat litters can be extremely hazardous to rabbits. The key to keeping a pet rabbit's cage pleasant and clean is the use of a bunny-friendly litter -- along with once-a-day sprucing up. Many types of commercial cat litters, however, can be a severe risk to rabbit health. Exercise ample caution in selecting the right litter for your cutie. Never under any circumstances use clay cat litters for your bunny's cage. Whether they clump or don't clump, these litters are harmful to rabbits if consumed. They can trigger digestive difficulties in the fluffy ones, the ASPCA website says. If clay is an ingredient, it isn't appropriate or safe for your rabbit's cage. Rabbits are big on munching things, after all. In some cases, consuming clay litter can be life-threatening. Most clay litters are dusty compared with non-clay litters, which is another serious danger for bunny rabbits. 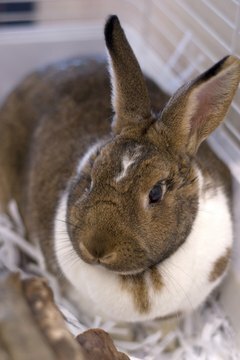 If your rabbit ingests litter dust through the mouth or the nose, she may experience issues with her breathing. Cat litters that consist of silica or clay can be hazardous to rabbits due to the risk of intestinal blockage. Impaction as a result of eating silica or clay can bring upon fatal consequences. If a cat litter has silica as an ingredient, it, like clay, is an automatic "no way." Pine and cedar-based cat litters can pose problems for rabbits. The wood chips of pine and cedar give off a marked toxic smell that can be harmful to your pet's liver enzymes. Many "natural" cat litters use these as ingredients, so pay attention and avoid them. The ASPCA recommends using either pelleted newspaper or Timothy hay in the rabbit's cage instead of cat litter. With frequent and thorough refreshing of these varieties of litter, your sweet pet should have a comfortable, clean and safe living environment. Before selecting any kind of litter for your bunny, however, always consult your veterinarian first just to be especially cautious. What Is the Difference Between Scoopable & Clay Kitty Litter?